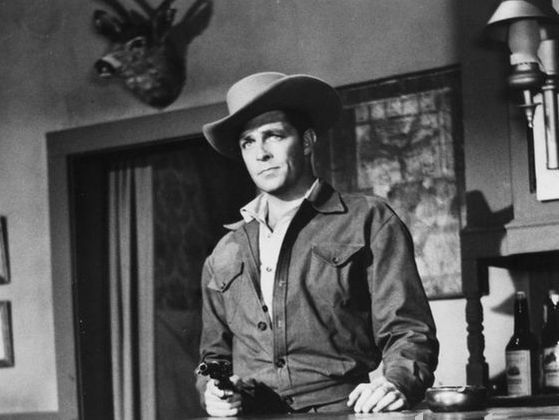 Dale Robertson | 50 Westerns From The 50s. 50s Westerns Blu-ray News #203: Canadian Pacific (1949) And The Cariboo Trail (1950). Kino Lorber has announced they’ll have Randolph Scott in The Cariboo Trail (1950) out on DVD and Blu-ray sometime this year. With a great cast (it was Gabby Hayes’ last movie), solid direction from Edwin L. Marin, and Cinecolor’s gloriously funky hues, it’s a load of fun and not to missed. First, Scott, Marin and producer Nat Holt gave us Canadian Pacific (1949). It’s not as good as the second picture, but I’m looking forward to seeing its Cinecolor in high-definition. Thanks to Mike Kuhns and Vitaris for the tips. Welcome to The Republic Pictures Blogathon. Over the weekend, we’ll be celebrating the studio’s incredible talent roster, wonderful output and lasting legacy. This page will serve as its hub, and you’ll be able to reach all the posts here. Keep checking back. One of my earliest movie memories, maybe the earliest, is of a 16mm print of John Ford’s Rio Grande (1950). So Republic has always been a huge part of my movie world. It was formed by combining a number of the Poverty Row studios, and the goal of its head, Herbert J. Yates, was always commerce over art. So in a way, it’s surprising their films displayed the level of craftsmanship that they did. That craft may be what, in the end, sets them apart. 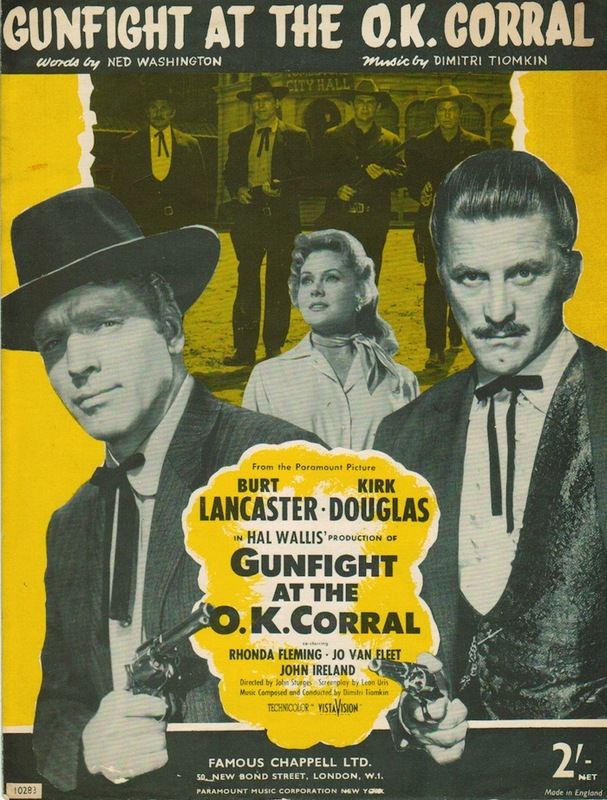 After all, there were lots and lots of B Westerns and serials out there. But there’s a polish to a Republic picture — from the camerawork to the editing to those wonderful special effects to the performances to the stunts, that’s very special. It’s easy to see why their films are still so popular. If only they were readily available on DVD and Blu-ray. Over the next few days, we have plenty to celebrate. The cowboy movies. The serials. The crime pictures. And on and on. Some great movie bloggers have saddled up or strapped on their rocket suit to be a part of this whole deal — and I really appreciate their efforts. This should be fun, folks! Click on the images below to be linked to the appropriate blog. 50s Westerns DVD News #170: The Best Of 2014. The charge was this: send in your list of favorite 50s Westerns DVD releases for 2014, along with a few 50s Westerns that you discovered this year. For today, here are your (and my) 10 favorite DVDs or Blu-rays released during the 2014 calendar year. 10. Panhandle (1948) This terrific Rod Cameron picture, directed by Lesley Selander, was released a few years ago as part of VCI’s Darn Good Western Volume 1. This year, it showed up on its on. 9. City Of Bad Men (1953) Dale Robertson leads a great cast: Jeanne Crain, Richard Boone, Lloyd Bridges, Hugh Sanders, Rodolfo Acosta, Don Haggerty, Leo Gordon, John Doucette, Frank Ferguson, James Best. Harmon Jones directs. 8. Fort Massacre (1958) Joel McCrea plays way against type. Forrest Tucker, Susan Cabot, John Russell and Denver Pyle co-star. You can get a nice regular DVD here in the States — and a stunning Blu-ray in Germany. 7. Gunfight At The O.K. Corral (1957) The guys who developed VistaVision look down from heaven, see this Blu-ray playing in our living rooms, and are very happy indeed. 6. The Lusty Men (1952) There was a time when Nicholas Ray was a machine that cranked out Great Movies. This study of modern-day rodeo cowboys — starring Robert Mitchum, Susan Haywood and Arthur Kennedy — comes from the heart of that period. 5. Drum Beat (1954) Alan Ladd shows us he’s got more than Shane up his sleeve, and Delmer Daves delivers yet another solid Western. This is a lot better movie than you’ve heard (or remember). 4. 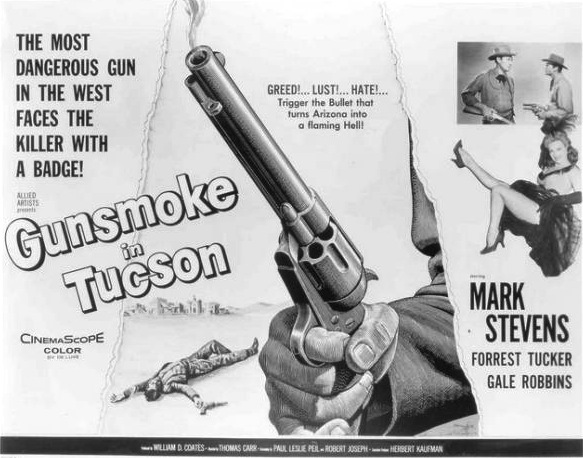 Gunsmoke In Tucson (1958) When an Allied Artists Western starring Mark Stevens makes a Top Ten list, I know I’m in the right place. 3. Tim Holt Western Classics Collection Volume 4 As good as the series Western ever got. For me, this fourth volume is the best — which makes it plenty great indeed. 2. Shoot-Out At Medicine Bend (1957) It’s not a stupendous Randolph Scott movie, but it’s a Randolph Scott movie — and Warner Archive has it shining like a black and white, 1.85 diamond. 1. 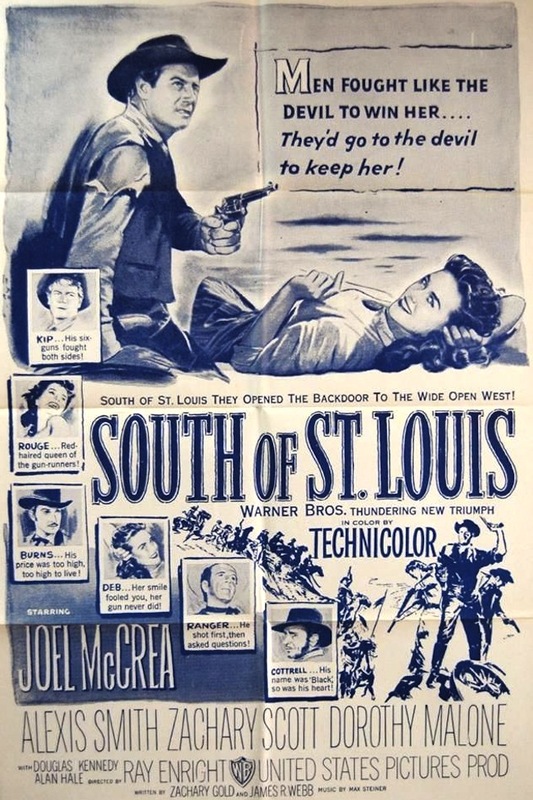 South Of St. Louis (1949) This terrific Joel McCrea picture, with its Technicolor appropriately saturated, is stunning on Blu-ray from Olive Films. Alexis Smith and Dorothy Malone should’ve paid cinematographer Karl Freund for making them look so beautiful. Along with all these favorites, there was a common complaint: that Olive Films’ promised The Quiet Gun (1956) didn’t make it in 2014. Thanks to everyone who sent in their lists. The Goldstein Brothers And The Gambler From Natchez (1954). This is producer Leonard Goldstein. At Universal-International he produced the Ma And Pa Kettle and Francis The Talking Mule films, along with Westerns like Cave Of Outlaws (1951) and The Duel At Silver Creek (1952). Moving to 20th Century-Fox, he formed Panoramic Productions to produce non-anamorphic films in the midst of Fox’s CinemaScope push. 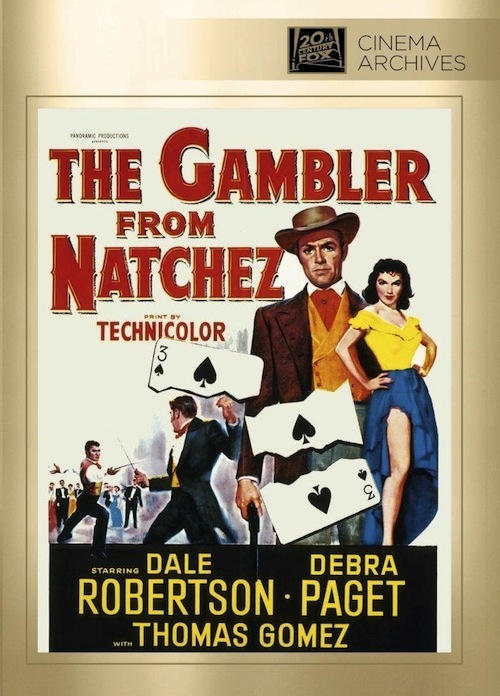 The Gambler From Natchez (1954) was one of those. When that contract was up, Goldstein started a production company with his twin brother Robert, but passed away in July, 1954 at just 51. 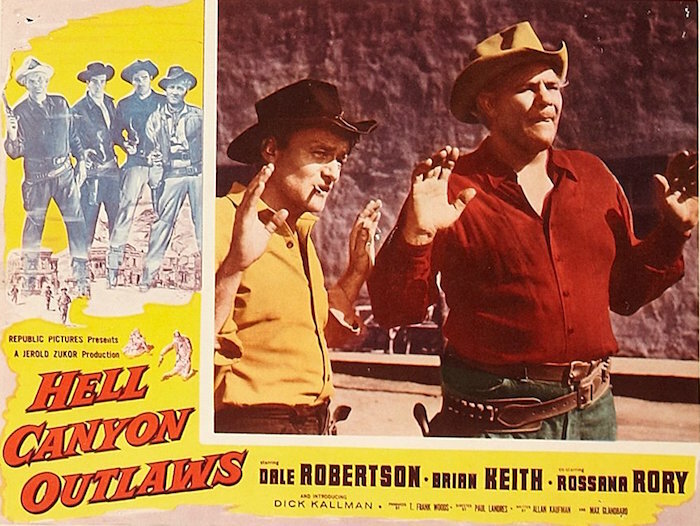 Robert soldiered on without his brother and went on to make a few excellent low-budget Westerns. Have a copy of the Fox Cinema Archives DVD of The Gambler From Natchez to give away. So it seems like a good time to have a contest. Look at the two-part question below. Be the first to email the correct answer(s) to fiftieswesterns@gmail [dot] com, and the DVD’s yours. Good luck. Of the Westerns Robert Goldstein produced, one starred Joel McCrea. What was the film and what color process was used for it? 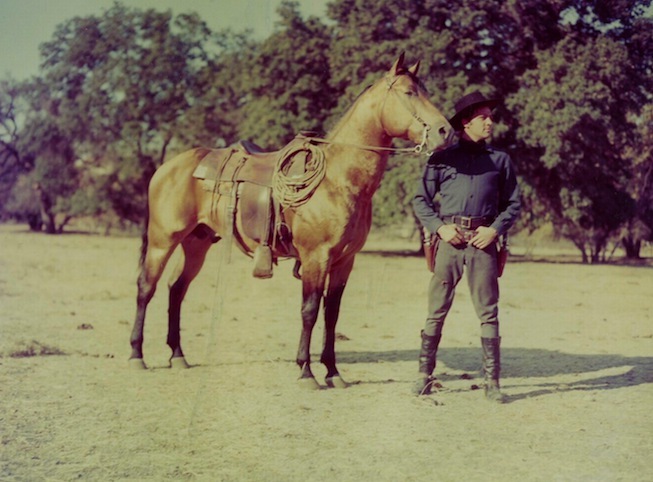 UPDATE: Lee was the first to come through with the right answers — Stranger On Horseback (1955) and Ansco Color. 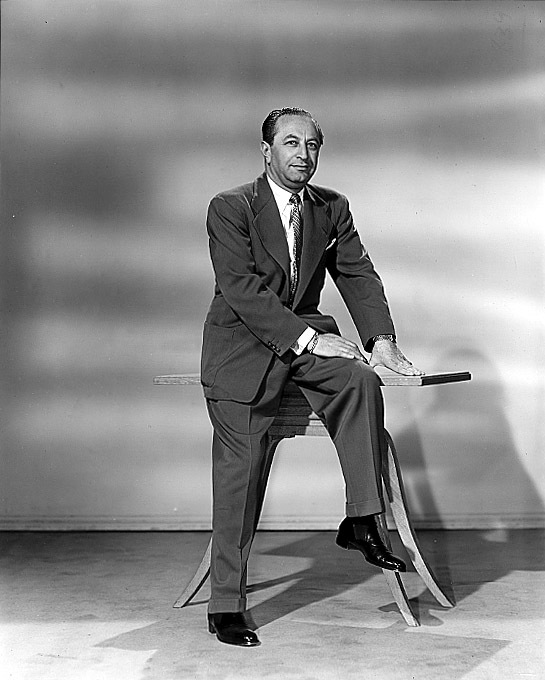 (It was Leonard that produced Saddle Tramp in Technicolor.) Thanks to everyone who sent in a response. 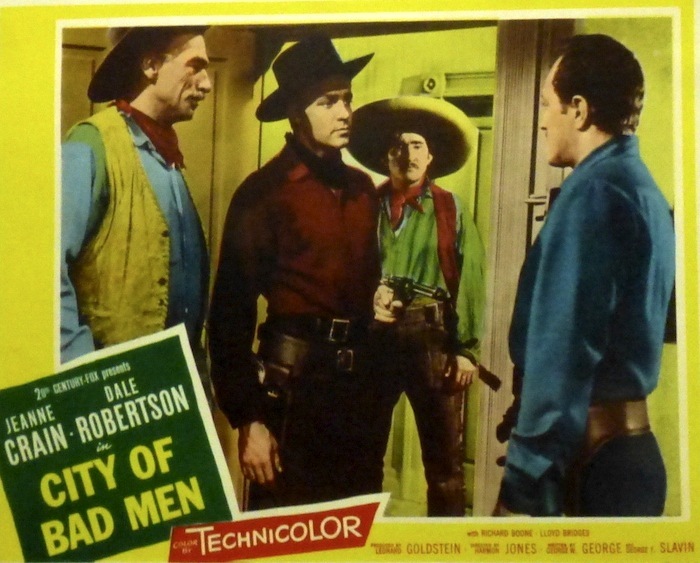 DVD Review: City Of Bad Men (1953). 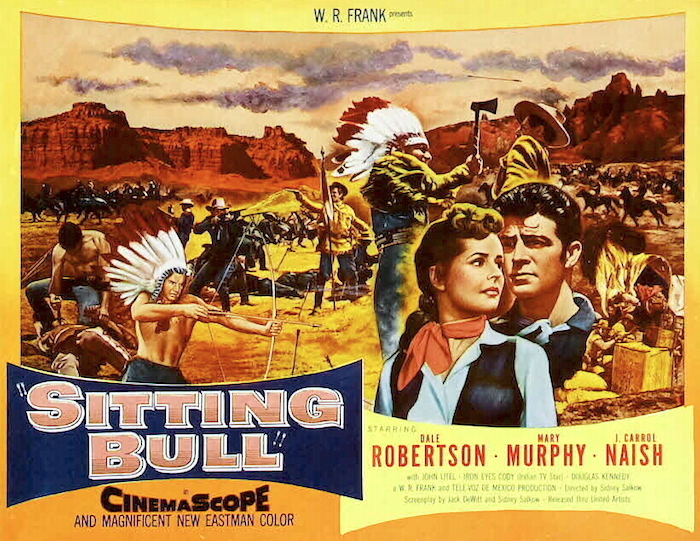 CAST: Jeanne Crain (Linda Culligan), Dale Robertson (Brett Stanton), Richard Boone (Johnny Ringo), Lloyd Bridges (Gar Stanton), Carole Mathews (Cynthia Castle), Carl Betz (Phil Ryan), Whifield Connor (Jim London), Hugh Sanders (Bill Gifford), Rodolfo Acosta (Mendoza), Pascual Garcia Pena (Pig), Don Haggerty (Bob Thrailkill), Leo Gordon, John Doucette, Frank Ferguson, James Best. 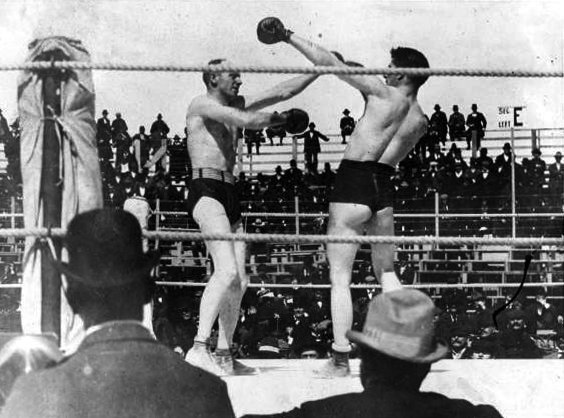 On March 17, 1897, in Carson City, Nevada, Bob Fitzsimmons knocked out “Gentleman” Jim Corbett in 14 rounds to become the World Heavyweight Champion. This historic boxing match is the basis of City Of Bad Men (1953), as bandits are drawn like flies to the event’s box office. 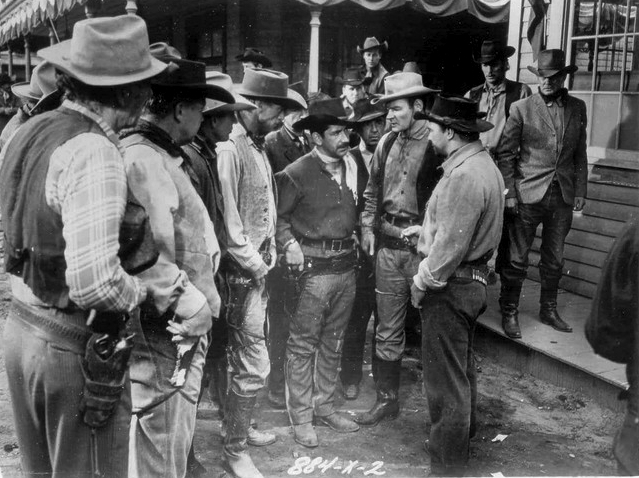 Among those ambitious outlaws are Brett Stanton (Dale Robertson) and his outfit, which includes his brother Gar (Lloyd Bridges), along with the gangs of Johnny Ringo (Richard Boone) and Bob Thrailkill (Don Haggerty). Complicating matters is that Brett is no stranger to Carson City, and he has some unfinished business with Linda Culligan (Jeanne Crain). It’s not long before Brett is torn between Linda and the money. 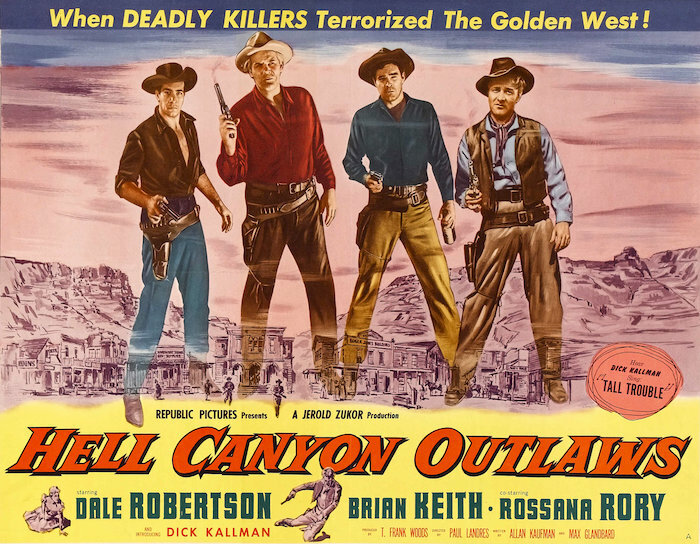 The story goes that Dale Robertson stayed away from acting classes in the early days of his career, and there’s a naturalism to his work that serves his Westerns well. While he’s known for Tales Of Well Fargo on TV, his feature work like City Of Bad Men is worth seeking out. If the part calls for it, he can drop his easygoing charm with ease. The more of his films I see, the more I like him. Harmon Jones didn’t direct many features before heading to TV. His five Westerns — The Silver Whip (1953), City Of Bad Men, A Day Of Fury (1956), Canyon River (1956) and Bullwhip (1958) — are perfect examples of what a medium-budget studio Western could be. A Day Of Fury is a fantastic film, one of the best Westerns to come out of Universal in the 50s — and that’s saying something. If Jones had made more Westerns, I’m sure we’d be grouping him with directors like George Sherman, Gordon Douglas and Phil Karlson. 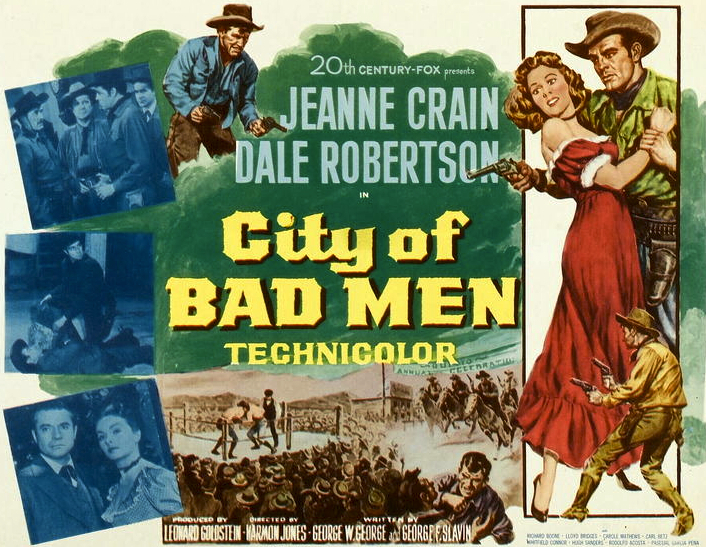 City Of Bad Men was produced by Leonard Goldstein, who produced many, many films for Universal (including the Ma And Pa Kettle series) and 20th Century-Fox. He clearly understood the importance of a strong cast and filled this one with pros like Frank Ferguson, John Doucette and Don Haggerty. He also gave a stage actor named Leo Gordon his first film work. Much of the film was shot on the Fox lot, with the titles and opening scene making good use of Vasquez Rocks. This was a common location for Goldstein’s Westerns — his Cave Of Outlaws (1951) and Duel At Silver Creek (1952) also used them. One of the utility stunt men on the film was Jack Young. City Of Bad Men is yet another solid middle-budget 50s Western, with a good script, great cast and handsome production values. Director of Photography Charles G. Clarke, who spent the bulk of his career at 20th Century-Fox, makes sure everything look terrific. All of this is nicely preserved and presented on the DVD-R from Fox Cinema Archives. There’s a blemish here and there, but the Technicolor is as eye-popping as you’d expect — and the audio is impressive. I preferred Jones and Robertson’s other films, The Silver Whip and A Day Of Fury, to this one, but have no qualms about recommending it highly. * The Astounding B Monster by Marty Baumann; ** Interview with the author.